From Palmer the drive to the cabin in the woods is 7 miles of paved roads(10 minutes). The cabin in the woods is located on 5 rural acres with a short drive up the mountain to the cabin. The main cabin is all log . One bedroom, large living room, spacious kitchen and bathroom in 576 sq ft. Tastefully furnished yet rustic. The kitchen has full size appliances and is well stocked with everything you will need except for food. The bedroom has a queen size bed. The deck out front looks out over the valley and is covered with clear panels to let in all the light. It is 10’ by 24’ and features a gas grill, table and chairs for 4 and lots of extra room for folding deck chairs. Beside the deck is a fire pit well stocked with wood. The second bedroom is a stand alone cabin just feet from the main cabin. 144 sq ft with a queen size bed, armoire and flatscreen tv. 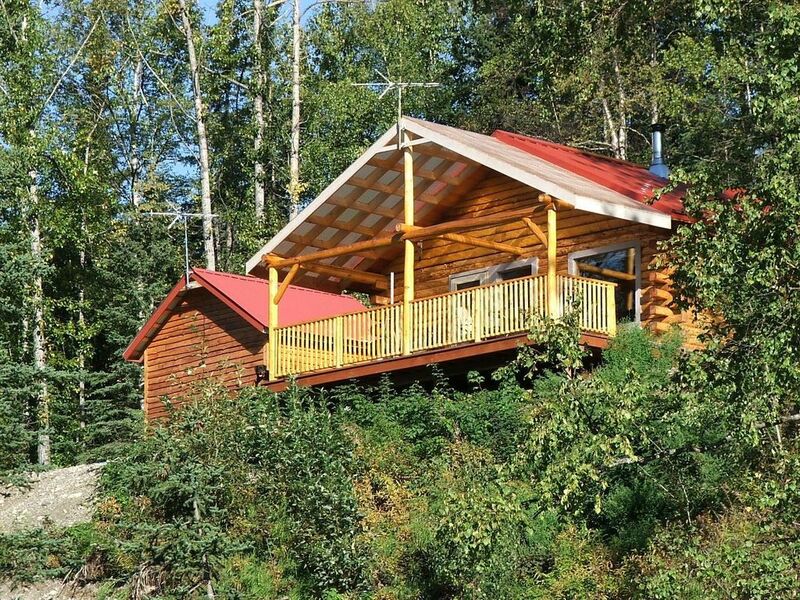 Our location in the famous Matanuska Valley gives you a centralized yet rural location to start your exploration of the great state of Alaska starting from the spacious front covered deck. The view stretches from the Knik River valley in the east , scans all the way along the Chugach Mountain Range including 3300foot(1005 meters) high Pioneer Peak to the Cook Inlet and far off Anchorage in the South West. From the Muskox farm just 10 minutes down the road to beautiful Hatcher Pass and its Historic hard rock gold mines to the Pioneer Museum in downtown Palmer you will run out of time before you run out of things to see and do. A 1 hour drive north up the Glenn Highway(hwy 1) is some of the most spectacular scenery the road system has to offer. At the end of that hour you will be at the Matanuska Glacier for the photo op of a lifetime. A must do drive. On the way back don’t forget to stop off at Sheep Mtn. lodge for a wonderful meal. Be sure and glass the mountain peaks behind the lodge for its namesake, Dall sheep. An hour the opposite direction is the eagle river nature center amid towering peaks on three sides. Walking trails will take you into the heart of this beautiful valley. If you haven't had enough hiking on the way back you can drive up the mountain to Thunderbird falls(a short hike) and beautiful Eklutna lake, the main source of Anchorages drinking water. Driving north on the Parks Highway (hwy 3) is also scenic with lots of places to stop and take pictures. The turnoff to Talkeetna is 2 hrs from the cabin. If it is a clear day the trip into Talkeetna could yield a fantastic view of Mt McKinley from the pull out just before you start down the hill into town. Once back out to the main highway continue north and look for the pull out once you have crossed Hurricane Gulch. This 1050 ft (320 meters) span is a breathtaking 254 feet(77 meters) above the white water of Hurricane Creek. Another 63 miles will put you at the turnoff to Denali Park. This is a long day trip so as evening approaches, even though the sun doesn’t set until close to midnight be on the look out for moose and caribou on the way home. Robert moved to Alaska in 1982 and settled in the Valley in 1997. Robert built this cabin himself in 1998. He lives on the property in a separate residence year round. When I purchased this property it was undeveloped. I had one thing in mind as I looked for my future home location. It had to have a view. So I drove to the location, got out and started hiking up the mountain. When I found a large flat spot among heavy timber I knew I was high enough to have a view but I couldn't see through the trees. I knew if I did enough clearing I would have that Alaskan view I had been dreaming of for so many years. I bought the property, built a driveway and cleared a site for my little log home. I can ride my 4 wheeler or snowmobile from my home to miles of trails in the mountains behind the cabin. Moose are seen all year round so pay attention every time you walk out the door. You might get the surprise of your life standing in the driveway. The quiet is something I cherish. The cabin is high enough above the valley floor to sit on the covered deck and watch the storm cells move across the valley. It is a wonderful feeling to sit under the deck cover when it is raining, all warm and dry and watch the day go by. Plenty of parking for oversize vehicles and boats. Pull through driveway. All dishes, utensils, pots,pans and knives. The dining area has seating for 2. TV trays for everyone else. The deck has a table and seating for 4 plus additional seating using camp chairs. This was a great accommodation; I travel usually alone on business to the Mat-Su area and of the various places I've stayed this is my favorite; ideal scale for one person (although other bedrooms are available in small adjacent dwellings). It had the quiet, peaceful surroundings I crave, great view with abundant natural light, very nice deck. Only negative is the well water which could use a purifier. That said, this was a very comfortable place to come home to after work and I will certainly visit again. Great view, cozy accommodations. Quiet and private. Great view. The covered porch is the best asset - morning coffee with the fabulous Mountain View was my favorite part of the day. Great kitchen, cozy blankets and even some board games. Beds were comfortable. Had everything we needed. Definitely recommend a stay here. Enjoyed property very much. Had everything needed for a place close enough to everything but far enough away to give you a sense of being remote. Porch was a great feature for kicking back and enjoying peace. Host left all the information you needed to find whatever you are looking for. Would definitely go again. Beautiful cabin with a beautiful view! Would definitely recommend anyone staying in Palmer to stay in this cabin. It is outside the city, quiet, and has an amazing view of the mountains. The owner was very accommodating and met with us when we arrived to explain where everything was. Fantastic views! Cabin was very clean and was stocked with everything we needed. Bob was a very good host! Great place to get that alaskan feel! Very cozy, quiet place with authentic Alaskan charm. Children under 12 stay for free Call me if you have any other needs I haven't mentioned. I will do my best to accommodate you. Monthly rate includes all utilities including heat,satellite,power,trash,water,snow removal.